Finding out that you're actually an alien child who crash landed on Earth after his home planet blew up is a real drag. But on the bright side, you might also find out that you have some awesome superpowers that you didn't know about! While we can't help you with discovering any hidden superpowers, this incredible Superman Costume from the Rubie's Grand Heritage collection will make you look just like the real Superman in the DC movie Man of Steel, which is also pretty super! The story we started out with is pretty much exactly what happened to Clark Kent. He grew up on a farm in Kansas, but once he learned he was actually a Kryptonian, Clark donned the uniform of his home world and started practicing the amazing powers he discovered he had, like x-ray vision, incredible strength, invulnerability, and the ability to fly, which are exactly the kinds of talents somebody wanting to fight crime should have. Before he knew it, Clark was saving the world and getting called “Superman”! Not too bad for a farm kid. 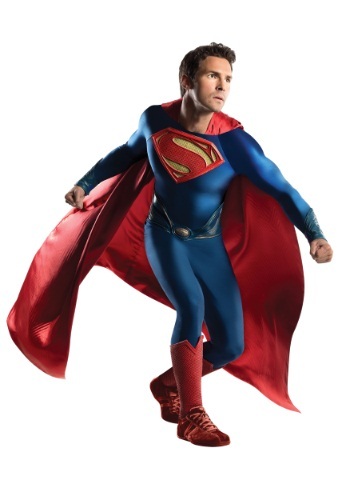 You'll look like you could save the world, too, when you're sporting this high quality costume, designed to capture the intricate details of the blue and red outfit Superman wears in the film! The iconic red cape snaps onto the jumpsuit, and molded latex pieces slip over the suit to complete this detailed look. And if anyone asks what the “S” on your chest stands for, tell them it's the symbol for Hope!